The following is the original preface to Rev. 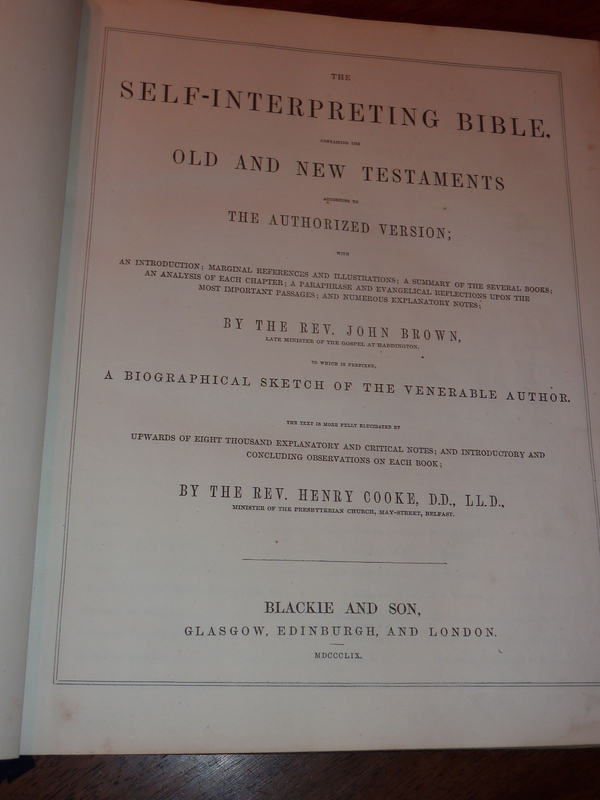 John Brown’s Self-Interpreting Bible, in which he explains the various features he’s included, and shows how they will aid the reader in understanding and profiting spiritually from the Word of God. I’ve highlighted the features as they occur throughout. The rest is original to the editor. My intention in the coming posts will be to demonstrate to varying degrees, each of these features, along with pictures of the numerous beautiful lithographs that are found along the way. Not to depreciate the valuable commentaries of Pool, Patrick, Clarke, Henry, Burkitt, Gill, and Doddridge, &c., but to exhibit their principal substance with all possible advantage, in a manner that might best comport with the ability and leisure of the poorer and labouring part of mankind; and especially to render the oracles of God their own interpreter, and enable every serious reader to judge for himself what doctrines ought to be believed, and what duties practiced by the Christian, are the avowed aims of this publication. In the copious INTRODUCTION, the principal proofs of the Divine Authority of the Old and New Testaments, and the rules necessary to promote the profitable perusal of the oracles of God therein contained, are largely exhibited. The connected scheme of the Hebrew Laws, and their evangelical signification,–and of the fate of nations, narrated or predicted in Scripture, as subservient to the glorious work of our redemption,–together with the large Chronological Index,–form a summary of the most celebrated labours of the learned world on these diversified subjects. An accurate attention thereto will, through the blessing of God, greatly assist in searching the Scriptures with success. The contents of the sacred books, and their respective chapters, are an accurate, full and explicatory representation of their subject. Properly attending to these, the reader must discern of whom, or of what, the Holy Ghost there speaks, and understand the passage accordingly. He may easily fix in his mind a general, but distinct view of the whole system of inspiration; and thus be capable, with the utmost readiness, to find out or compare whatever passages of Scripture he may desire. The EXPLANATORY NOTES are chiefly confined to the figurative, the prophetic, and the practical parts. Here the obscurity of Scripture, or the importance of faith and holiness, chiefly required them. In our Saviour’s delightful discourses, and the epistles of his inspired Messengers, our holy religion is most fully delineated; and there the explication is peculiarly extensive, and attempts to exhibit the substance of many learned and expensive commentaries, in a manner which, attending to the beautiful connexion, clearly unfolds the scope and meaning of the Spirit of God. A particular and lively application of divine truth to the heart, and an unspotted holiness of conversation, being the immediate end of God’s revelations to men, the contents of each chapter, which are often in an explicatory manner, are in the Reflections practically summed up, and directed home to the reader himself, for enlightening his understanding, awakening his conscience, warming his heart, and for directing and animating his practice. An exact knowledge of the seasons in which the oracles of God were delivered, or the events mentioned in them took place, being of no small importance for obtaining a distinct perception of their meaning, the dates before and after our Saviour’s incarnation have been adjusted from the best chronologers, and marked in the margin. But, as every Protestant must allow the Scripture itself to be its own best interpreter—as God, to oblige men to a diligent search of his word, comparing spiritual things with spiritual, has seldom fully unfolded any of his more important truths in one particular passage—the uncommon collection of Parallel Scriptures, such as is not to be found anywhere else that I know of, has formed the most laborious, and will, to the diligent peruser, be found by far the most valuable part of the work. Some of these are similar in phrase, others in meaning, and, in fine, others in their scope and design. In these, and others which may be added, we have a delightful view of the harmony of the Scripture, and multiplied proofs of every article of our Christian faith; we have a real Concordance, which may abundantly furnish preachers and others with their desired quotations; we have, in little room, a large Commentary, infinitely more certain than any dictates of men; and of which the very words are, as nails and as goads, pointed and fastened by the great Master of assemblies. In a truly diligent comparison of them, many texts all at once explain, and are explained by each other. Nor, unless at first, will the careful reader find much trouble in comparing the texts: but the mere view of the marginal quotations will direct his memory to that part of them which corresponds with the sentence to which they are annexed for explication. 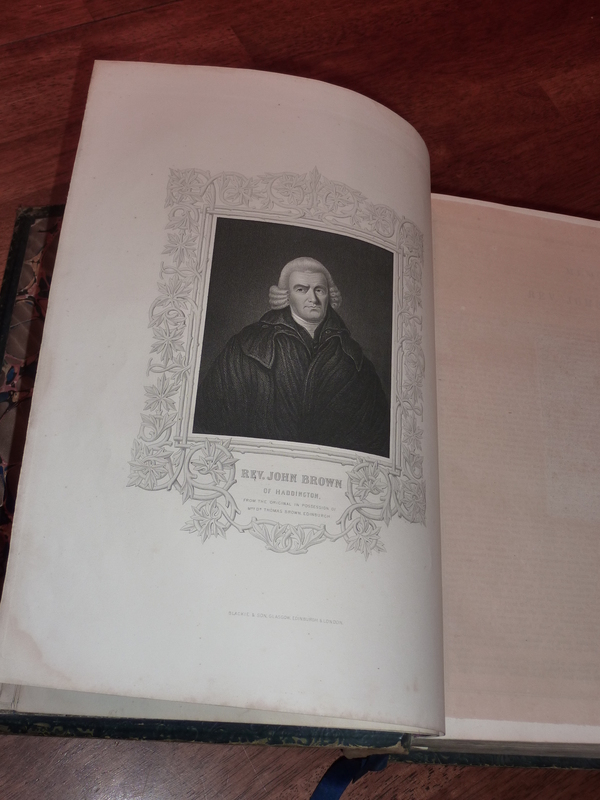 And, for his encouragement, I can only say, that my labour, in collecting the parallel texts in this work, has afforded me much more pleasant insight into the oracles of God than all the numerous commentaries which I ever perused. Thus we may listen to, and converse with God, and lay our consciences open to the inspired arrows of our all-conquering Redeemer;–we find his words, and eat them, to the joy and health of our soul; we hide them in our heart, that we may not sin against him; we become mighty in the Scriptures, and expert in handling this sword of the Spirit, in opposition to every enemy of our soul: in fine, we are made wise unto salvation; are reproved, corrected, and instructed in righteousness, and perfectly furnished for every good work. May the Lord himself prosper it for these ends!